This week's theme is social studies and I am going to stretch my recommendation just a wee bit. 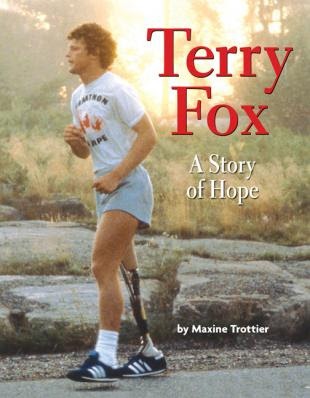 My book is: Terry Fox - A Story of Hope by Maxine Trottier. I did not put the full title of this book in my blog post title because I did not want people to think - oh that is just a book for Canadians!! It is NOT, it is an amazing story for everyone!!!!! 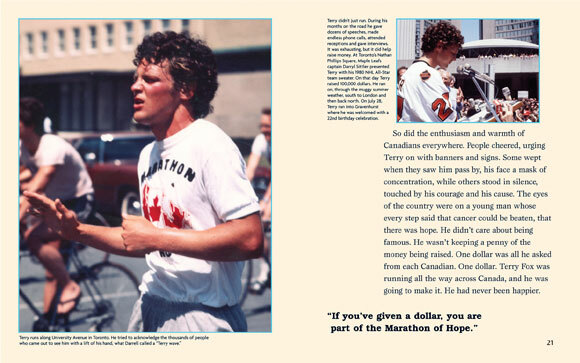 Terry Fox was a Canadian athlete, humanitarian, and cancer research activist. In 1980, with one leg having been amputated, he embarked on a cross-Canada run to raise money and awareness for cancer research. Although the spread of his cancer eventually forced him to end his quest after 143 days and 5,373 kilometres (3,339 mi), and ultimately cost him his life, his efforts resulted in a lasting, worldwide legacy. The annual Terry Fox Run, first held in 1981, has grown to involve millions of participants in over 60 countries and is now the world's largest one-day fundraiser for cancer research; over C$500 million has been raised in his name. Here is a little video (watching the videos makes me cry every year when we show them at our Terry Fox Run/Walk assembly - I know he is going to die but it gets me every year - cried watching it to embed this one here). "How many people do something they really believe in? I just wish people would realize that anything's possible, if you try: dreams are made, if people try. When I started this run, I said that if we all gave one dollar, we'd have $22 million for cancer research, and I don't care man, there's no reason that isn't possible. No reason. I'd like to see everybody go kind of wild, inspired with the fundraising." Also the book is written in a way that makes the story accessible for elementary students but still rich. The story brings up a lot of personality traits or attributes - determination, perseverance etc. and would be a great way to introduce these values or study personality traits. Here is another great video with the Rod Stewart song Never Give Up on a Dream that I love, just in case you were still unsure if you wanted to read the book about this incredible individual. Looks like a great book and an inspirational story! I have NEVER heard of Terry Fox, but wow! What an amazing person. Today would have been his 55th birthday, from the gravestone pictured in the video. I LOVE this book and often use it for back to school. I think that I saw a 30 for 30 on ESPN about him. He has a wonderful story!! What an inspirational story. I will have to check this book out. I'm sure my kiddos would enjoy it. Wow! I've never heard of him either! We share a birthday! Touching! I will have to look into all of this for sure! Thanks for linking up!! Terry Fox! What a great Canadian hero! That is a great book... I cry every year when we watch the video. Thank you for introducing me to Terry Fox! I love biographies and this sounds so inspirational-I MUST have it! Such a great story of perseverance! I cried my eyes out watching that video! This is beautiful AMC! I love it!!! Much like in my other post, anything that makes my students think beyond their own little world, the better. As a teen, I would go to my mom about "girl drama" and she would reply, "You never know what is going on in (insert name's) life." I disliked that response as a teen, but now I get it! Think beyond and do what you can to make our world better! Love it and sharing with my teachers.